Cheap Airsoft shotguns – Are they any good? Today we’ll talk about one of the weapons you see less often in airsoft – Shotguns. There are many models available from high full metal ones to very cheaply made plastic ones. I will first talk a bit about what shotguns are used in real life for and what they are good for in airsoft. If you want to skip straight to my recommendations, just jump to the end of the post. I will especially focus on cheap airsoft shotguns as I can’t really recommend getting the more expensive ones for playing airsoft since you can get so much more for the money buying an AEG or gas operated rifle. The expensive ones can of course be very fun if you are just collecting replicas for other reasons, so take into consideration that I’m talking from playing perspective. In real life shotguns are usually simple, affordable and powerful at close ranges. Their effectiveness is based on the fact that they usually fire a round consisting of several lead or metal BBs or shots. When the shots leave the barrel they start to spread. This effectively increases the chance to hit you target and that’s why shotguns are the preferred weapon when hunting birds. Shotguns can fire a variety of rounds with different amounts of shots depending on the application. This includes slugs – a single bullet type round with immense stopping power at close to medium distances. 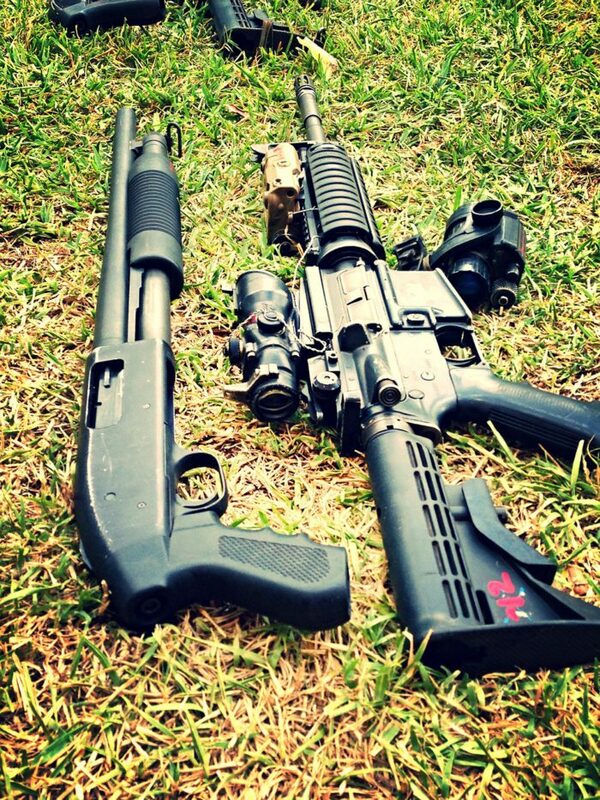 Shotguns are also commonly used by law enforcement units as a more powerful option to sidearms. In law enforcement the ranges of engagement are relatively short and it’s important that shots fired in a fire fight don’t penetrate surrounding structures to avoid bystander casualties. So in this role the shotguns high stopping power combined with low penetrability is a natural choice. There are military shotguns but they are very rarely used for other purposes than security and guarding duties by military police. In military application the short range, low ammo capacity and low penetrability make shotguns a one trick pony for close quarters assault. An assault rifle in full auto or bust mode is as effective for close range battle with superior penetration power and they are also effective at longer ranges when used semi auto. This is the reason why assault rifle is the weapon of choice for pretty much all military forces around the world. Real life shotguns can be break barrel, pump-action, semi-automatic or full automatic. 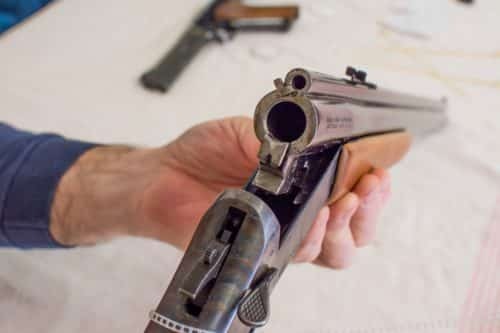 Break barrels shotguns are very common in hunting due to simple construction, pump-action is probably as common in hunting and most common in law enforcement. 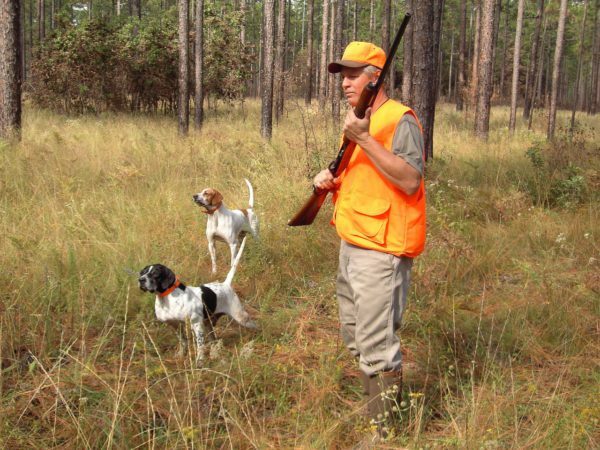 Semi auto shotguns are used for hunting and by the military. Full auto shotguns are only used by military due to the immense firepower and need for training to operate one effectively. They are extremely rare even in that application though. Now that we know the uses of real shotguns, let’s look at how they reflect to airsoft. Firstly in airsoft the range of engagement is generally very short, pretty much the same that would be effective with a real shotgun. This means that airsoft shotguns are quite easy to replicate by range standards and can be used for what’s considered medium to long ranges in airsoft, depending on the model. Secondly there is no penetrability with airsoft BBs, so this is a variable we don’t need to consider. What airsoft shotguns usually share with their real rifle counter parts is low ammo capacity and the lack of automatic fire. This means using them as a main weapon against an AEG puts you in a disadvantage. They are best used as back up weapon if your main weapon fails. They are usually too cumbersome to use as a true sidearm though. One thing about airsoft shotguns is that you can get a fairly powerful airsoft gun with a decent range for a very affordable price. If you are just getting in to airsoft and really can’t afford an AEG, you can get a decent quality shotgun with good range for around $50. Don’t expect to dominate the game but at least you have a fighting chance. You just have to count your shots and learn how play stealthily to use the element of surprise in your advantage. There are spring and gas operated airsoft shotguns but there are no electric shotguns that I know of. In general the gas operated shotguns use shells that look like real ones that are loaded with green gas and BBs. So the shotguns essentially work just like real ones, with the only difference being that instead of gun powder there is gas in the cartridge. This is a big problem in airsoft games. It means every shell is single shot and unlike real shells you have to be careful to collect them since they are reloadable and quite expensive. This makes them very inefficient weapons for games. You can find gas shotguns in break barrel sawed off double barrel models and pump-action ones. Both share the problem of single shot shells. Gas shotguns are also rather expensive so they really only serve the replica hobbyists and live action role-play purposes. Since the topic is cheap airsoft shotguns, I will focus on spring operated ones from this point forward. Spring operated airsoft shot guns come in two varieties. Single BB firing with internal or external magazine and 3 BB firing with a shell magazine. Spring operated shotguns are always pump-action models. The single BB firing models are usually the cheapest and offer decent power and range for a very affordable price. The 3 BB firing models are usually a bit more expensive. They are all based on the Tokyo Marui shotgun system with three barrels which they introduced in the 90s in their spas 12 and Benelli shotguns. The performance in general is pretty good and firing 3 BBs at a time increases your chance to hit your target significantly. The shell magazines hold 30 BBs, so you get 10 shots before you have to reload. The reload process is fairly simple yet not as fast as with an external clip AEG for example. This means you have to count and think your shots. My first recommendation is the Crosman ASGM47 Voodoo Spring Powered Single Shot Pump Action Shotgun. It is a VERY high-powered (up to 390 fps) single fire shotgun for a very affordable price. The build quality is very good considering the price and the fact that it comes equipped with hop up (this increases range), very high power, a stock and a tactical rail for attaching sights is pretty astonishing considering it costs a bit over 30 bucks. IMPORTANT: The description says you can fire full auto in electronic mode, this is complete nonsense. The gun is 100 % spring operated and does not contain or can not be modified to use any kind of electronically operated mechanism. For a cheap spring operated gun the gun is very good however and Crosman is a very well-established manufacturer that has been making air guns for decades and in recent years has started making airsoft guns as well. -i recommend getting a reflex sight for the shotgun since it doesn’t come equipped with any kind of iron sights. The gun is modeled after the Benelli M3 and the build quality and reliability are superior for the price point. This is probably due to the fact that the gun is an exact copy of Tokyo Maruis Benelli which was a very high quality shotgun back in the day. Double Eagle is a Chinese airsoft manufacturer with a long track record and is known for making decent quality airsoft guns for a very affordable price. So that’s about it of the topic of cheap airsoft shotguns. Thinking about getting one or have questions? Drop a comment and I’ll get back to you! had no idea there are gas operated ones. That is pretty cool. I have never used one before, but by brother has some, and I’m going to have to go get together with him and try it out. Thanks so much. Next PostNext Are biodegradable airsoft BBs any good?